Ingredients: Water, Behentrimonium Chloride, Caprylic/Capric Triglyceride, Hydrogenated Castor Oil, Cetearyl Alcohol, Butyrospermum Parkii (Shea) Butter*, Stearyl Alcohol, Glycerin (Vegetable), Honey, Butyrospermum Parkii (Shea) Oil, Yogurt Powder, Yogurt Extract, Cocos Nucifera (Coconut) Oil, Simmondsia Chinensis (Jojoba) Butter, Hydrogenated Jojoba Oil, Adansonia Digitata (Baobab) Seed Oil, Trichilia Emetica (Mafura) Seed Oil, Allantoin, Panthenol, Hydrolyzed Vegetable Protein PG-Propyl Silanetriol, Tocopherol, Triethyl Citrate, Caprylyl Glycol, lnulin, Benzoic Acid, Fragrance (Essential Oil Blend). Shea Moisture Mongongo and Hemp Seed Oils High Porosity Moisture-Seal Masque ($16.99 CDN): This was my original Shea Moisture deep conditioner love and still remains one that I adore the most. It’s a bit heavier than the former product but never weighs down my fine high-porosity wavy curls. It’s unfortunately only available online in Canada or at specialty beauty supply stores. It’s smoothing and curl-clumping and gives serious bounce. It contains butters, oils, fatty alcohols, slip agents and a moderate dose of protein. It’s incredibly concentrated and has fantastic slip and consistently gives good multiple day hair without dryness seeping in. This is the one that restored my faith in deep conditioners’ ability to restore curls. It doesn’t contain coconut oil, which I only mention because it can be problematic to some and is included in many deep conditioners. Ingredients: Water, Cetearyl Alcohol, Butyrospermum Parkii (Shea) Butter, Theobroma Cacao (Cocoa) Seed Butter, Capric/Caprylic Triglycerides, Cetyl Alcohol, Stearyl Alcohol, Behentrimonium Chloride, Behentrimonium Methosulfate, Glyceryl Caprylate, Macadamia Ternifolia Seed Oil, Hydrolyzed Adansonia Digitata Seed Extract, Fragrance (Essential Oil Blend), Argania Spinosa Kernel Oil, Hydrolyzed Rice Protein, Chondrus Crispus Extract, Hydrolyzed Soy Protein, Tocopheryl Acetate, Ricinus Communis (Castor) Seed Oil, Ricinodendron Rautanenii (Mongongo) Seed Oil, Vinegar, Cannabis Sativa (Hemp) Seed Oil, Panthenol, Cetrimonium Chloride, Hydrogenated Vegetable Oil, Hydroxyethylcellulose, Glyceryl Undecylenate, Sodium Benzoate. Curl Junkie Repair Me Reconstructive Hair Treatment ($34 CDN): This is unfortunately a harder product to track down, especially in Canada, yet again. It’s only available at select salons that use this line and specialty beauty supply stores/ online retailers- I picked mine up from Honey Fig. It’s actually a unique product, with enough hydrolyzed protein to add definite elasticity and bounce back to the hair, help repair damage and prevent breakage, while also being very conditioning and detangling. I noticed a real bounce brought back to my curls from deep conditioning with this and I found that it left my hair with the most slip out of maybe any product I’ve ever tried and lasting hydration. It’s a traditional thick conditioner texture with the nourishment you would expect from a mask. It doesn’t have any shea butter or coconut oil so I think it would be a lighter weight option for those that have a real sensitivity to those ingredients. Garnier Fructis Strengthening Treat 1 Minute Hair Mask ($5.99 CDN): I really like this silicone-free and drying alcohol-free hair mask and was really happy to learn recently that there’s larger sizes available – and accessible, even in Canada – because this 100 mL size would not last forever, especially if you aren’t as much of a product junkie as I am. It works to hold moisture in my hair when I use this as a deep conditioner or rinse out and it’s quite smoothing and nourishing, without adding any sort of weight to the hair. It’s protein-free so I highly question the strengthening claim but it’s a great purely moisturizing deep conditioner. It has enough slip to detangle with without difficulty. It has your usual fatty alcohols, glycerin, shea butter, olive, soybean, sunflower seed, coconut and avocado oils, along with rosemary extract. It also has that nostalgic salon-y banana scent that I enjoy. 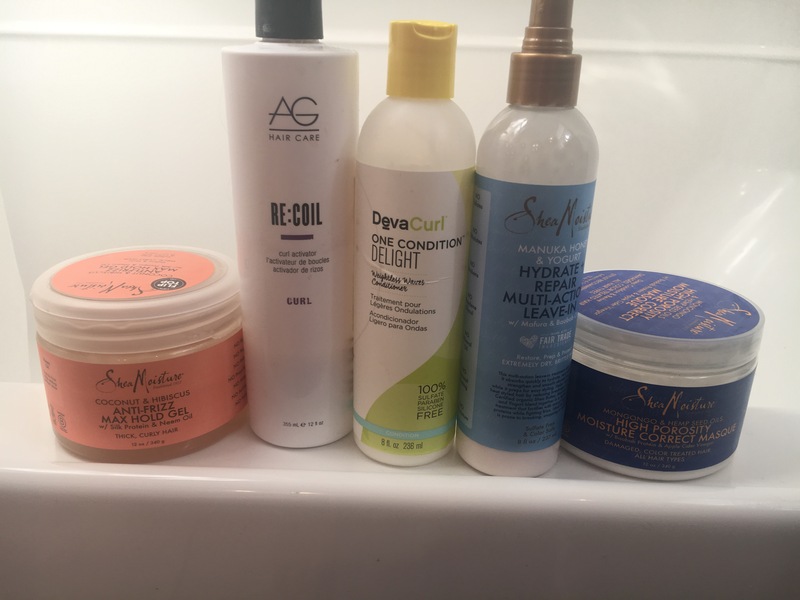 Shea Moisture Manuka Honey & Yogurt Hydrate + Repair Conditioner ($13.99 CDN): I was originally going to end the post before this product but I thought to myself that it would be helpful to include other options for deep conditioning that aren’t as heavy. I know many don’t go for the intensive more butter and oil-heavy masks that I seem to adore as they can be heavy on some hair types – especially wavies that are prone to products building up on their hair. I think that if you are looking for some extra nourishment for your hair but find traditional thick masks heavy, this thick standard conditioner may be worth a shot. It’s not as thick as the deep treatment in this line but it still has a thicker consistency; however, it’s probably among the lighter of Shea Moisture’s offerings. I’ve used it as a deep treatment with nice results but it’s honestly my favourite as a rinse-out conditioner, as it’s nicely moisturizing and curl clumping without weighing down my hair in the slightest. This one doesn’t even contain water soluble silicones, has some slip agents, shea butter and oils. It has a tiny amount of protein in it. It’s available in Walmarts too which I adore. Ingredients: Water, Glyceryl Stearate, Cetearyl Alcohol, Cetrimonium Chloride, Butyrospermum Parkii (Shea) Butter*, Stearyl Alcohol, Glycerin (Vegetable), Honey, Yogurt Powder, Yogurt Extract, lnulin, Trichilia Emetica (Mafura) Seed Oil, Persea Gratissima (Avocado) Oil, Evening Primrose (Oenothera Biennis) Oil, Adansonia Digitata (Baobab) Seed Oil, Aloe Barbadensis Leaf Juice, Panthenol, Bisabolol, Tocopherol, Triethyl Citrate, Caprylyl Glycol, Benzoic Acid, Fragrance (Essential Oil Blend). Do you have a favourite deep conditioner?